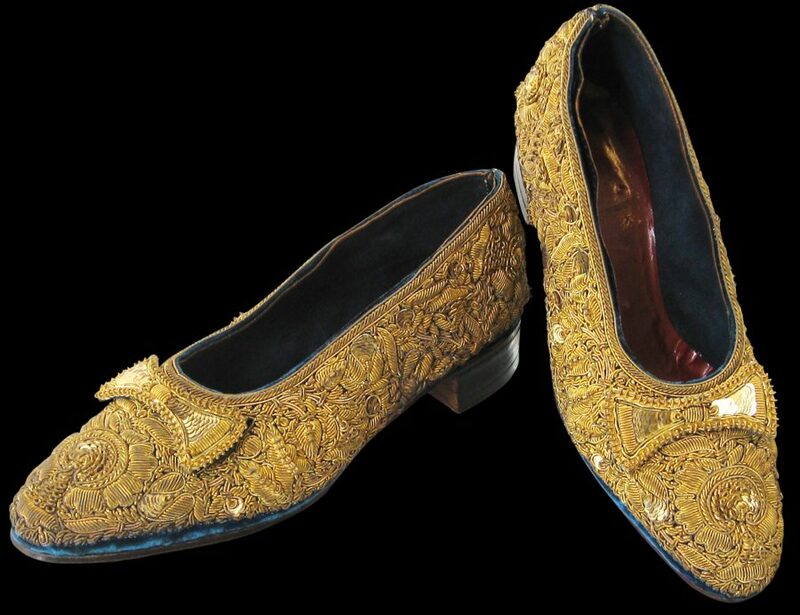 Almost certainly made for an Indian maharaja or a close relative, this sumptuous pair of blue velvet shoes extravagantly embroidered with gold thread is of exceptional quality and condition. 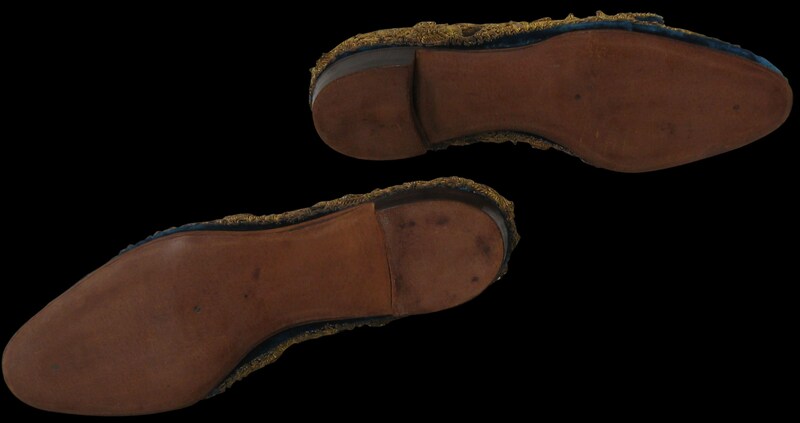 The shoes are soled and heeled with leather which show almost no wear – such shoes would not have been worn outside and would only ever have been used to walk over carpet. Indeed, as part of a princely costume, they are more designed to be seen in, for official functions and perhaps to be worn for official portraits and photographs. 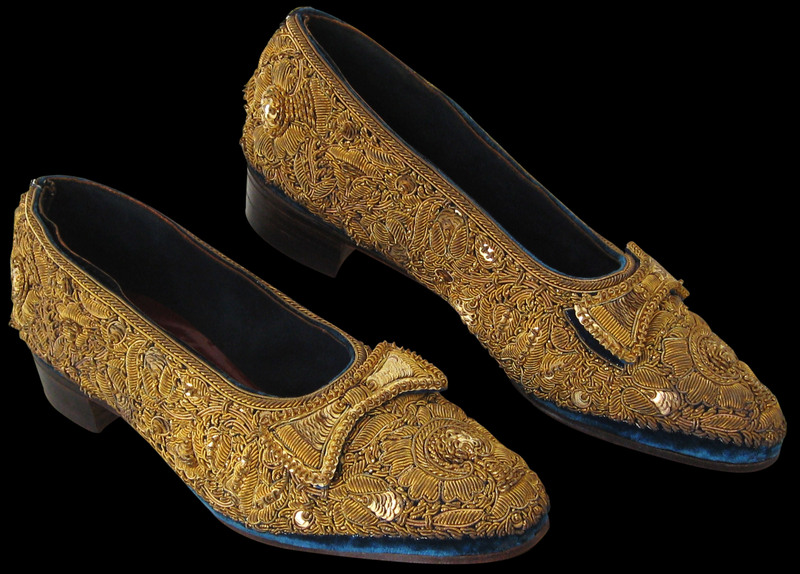 The shoes are densely embroidered over a blue velvet base with raised floral patterns in thick gold thread and gold spangles – the spangles are particularly fine and small in comparison with the larger examples encountered today. 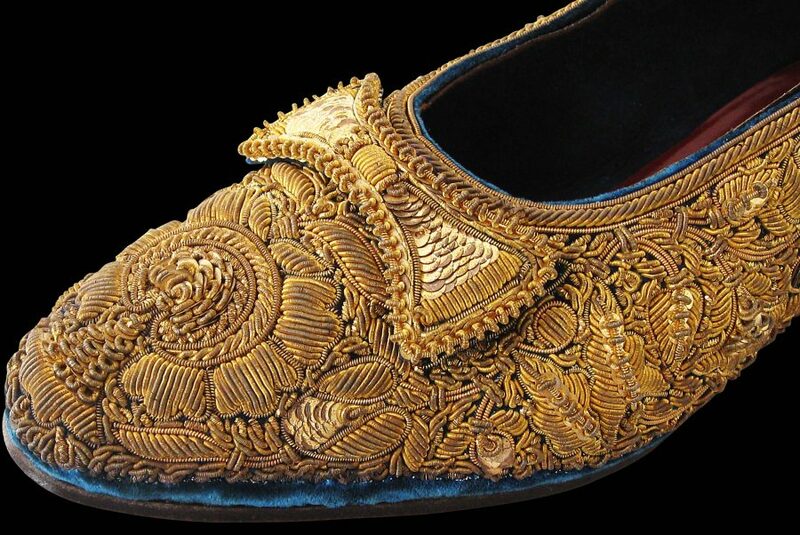 This type of work known in India as zardozi whereby raised gold embroidery was added to velvet, probably was introduced by the Portuguese. Many Indian royal houses commissioned zardozi embroiderers to embellish jackets, shoes, umbrellas and other articles with this work that were to be worn and used in the court. 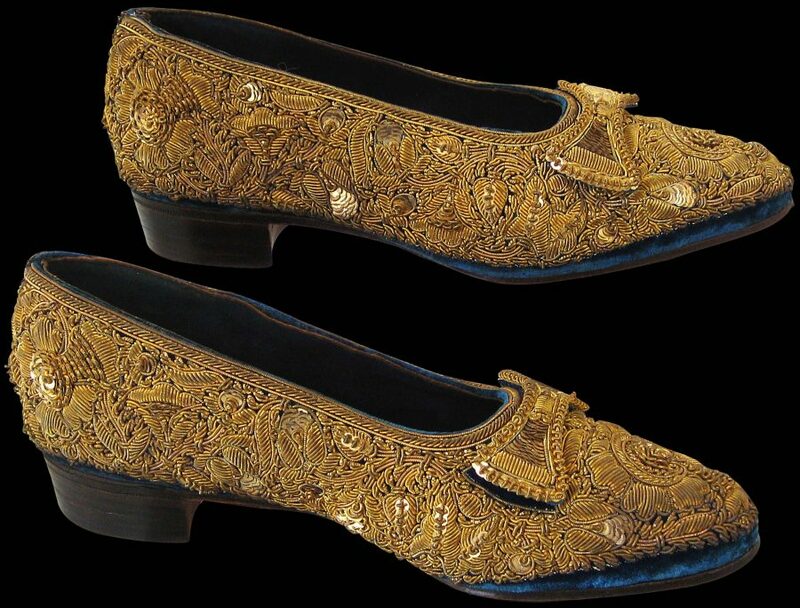 The zardozi embroiderers typically were Muslim men. 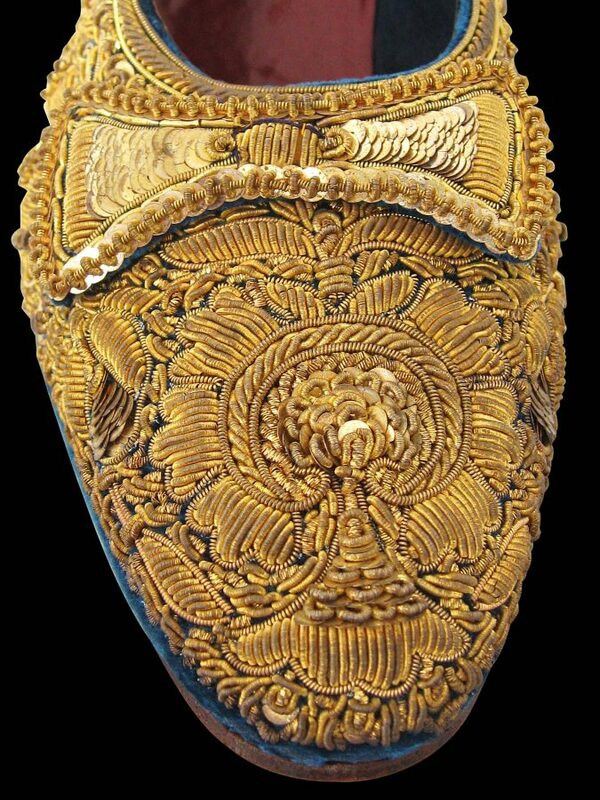 Each shoe has a cut out bow applied. These too are finely edged with zardozi embroidery and decorated with a profuse overlay of tiny spangles almost giving the illusion of fish scales. 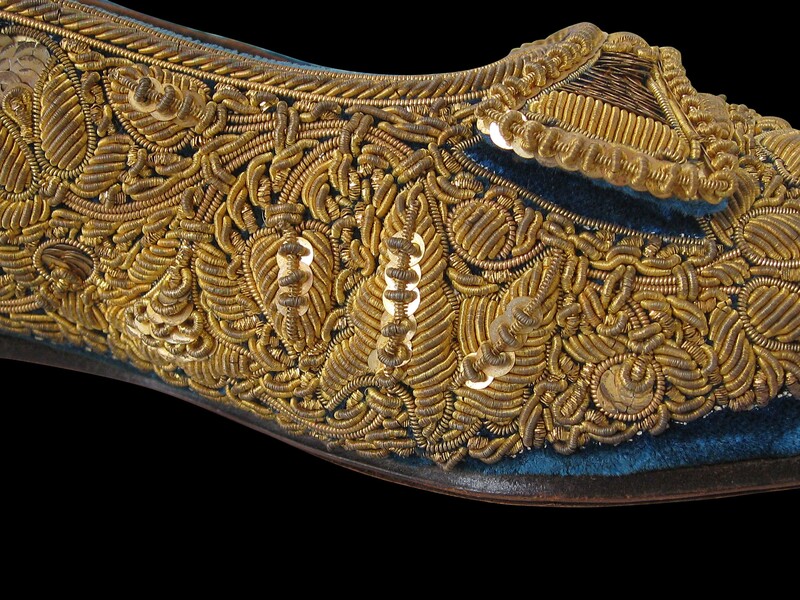 Overall, these shoes are extraordinary for the fineness and density of the zardozi decoration but also for their almost pristine condition. Arts of India, Virginia Museum of Fine Arts, Philip Wilson Publishers, 2001.